Every so often, a student will tell me that his (it’s usually a boy) mom has put the kibosh on graphic novels. “I’m not allowed to check out any more comics,” he’ll say, wandering aimlessly off into the chapter book section. *Womp womp* I nod and smile sympathetically, but inside I’m wondering what we are doing to our kids’ love of reading by telling them their choices are a waste of time? I know graphic novels can be what I call a gateway drug to other books because parents have told me so. In fact, today I approached the mom of a reluctant reader about the two Wimpy Kid books from the school library (ahem) that her son accidentally left in a foreign country. Yeah, I won’t be seeing those books again. But let’s focus on what she told me: once he found the Wimpy Kid series, she didn’t have to nag him to read anymore! He even came to the library today wanting to check out more books–score one for reading! I have heard similar comments from parents about the Big Nate series. I’m not sure everyone considers Diary of a Wimpy Kid and Big Nate to be true graphic novels, but let’s not quibble over details. Kids are reading, people. This is good stuff. The thing is, graphic novels are not just a way to get kids reading. Just like any genre, there is some great literature being written in this form. In graduate school, I was assigned American Born Chinese by Gene Luen Yang, and this book blew my mind with its interwoven storylines and takedown of prejudice both subtle and obvious. 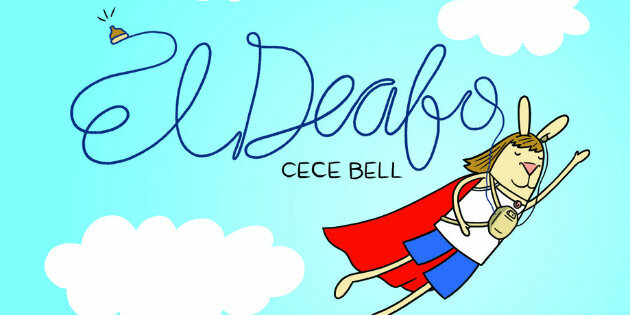 I just finished reading another masterpiece in graphic novel form: El Deafo by Cece Bell. I have no idea why Bell decided to draw her human characters as rabbit-like creatures when the book is basically an autobiography, but it works. We follow Cece as she is diagnosed with meningitis as a small child and survives the disease only to find her hearing permanently damaged. Young Cece’s experiences resonate because they are familiar in many respects: moving to a new town, bossy friends, unrequited crushes, and a general feeling that you are different and weird. Cece, however, is navigating these waters with the added complication of her disability. At school, she must wear Sonic Ear, a cumbersome sound amplifier, on her chest. Her humiliation at wearing this device is tempered when she realizes she has the superability to hear her teacher’s voice from anywhere in the school (even the restroom–heehee). Much of Cece’s social isolation results from her inability to participate in activities that make lip-reading impossible: watching TV, listening to the radio, and whispered conversations at sleepover parties. To deal with her frustration, Cece creates an alter ego – El Deafo – who has a solution for every awkward, demeaning situation she encounters. Bell stated in an NPR interview that she wanted readers to see the humor in her situation – the misunderstood words and the funny things that happen when you rely on equipment such as the Sonic Ear. Like Greg Heffley, Cece gets to struggle through the joy, pain and absurdity of childhood, the hero of her own story. I challenge any adult who believes “comics” have no place in our children’s lives to read El Deafo. They will discover one of the most relatable, vulnerable, triumphant main characters in children’s literature. When did we start judging storytelling based on the number of words on the page, anyway?